Where were ancient Indus agricultural fields located? Modern Harappa with Mound AB in the distance. 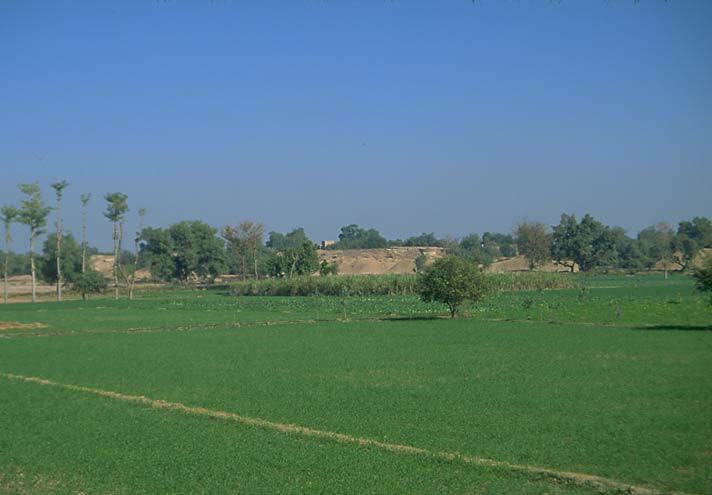 We keep reading that agriculture was prevalent in the Indus Valley Civilisation. But when I read about the planning of the settlements, I was confused as to where exactly the fields were located. Were they outside the walled settlements? Or were they located somewhere within the Lower Town? That’s a good question. Based on my experience living at Harappa during the field seasons I was engaged in excavations and my survey, the fields were outside of the city itself. On the Beas survey that I conducted – this is a dried up river bed, where we found many Indus sites for the entire period when Harappa was occupied. There, there are abundant fields growing many of the crops we know of from the Indus period. So, judging by the city plans, as you have observed, they didn’t grow food there = perhaps small gardens in their courtyards? But I think they probably kept a few animals, for milk, etc. Yet, other animals grazed outside, and of course, the water buffalo would have been brought to water for watering down, since you probably know they need that. The bulk of them, no doubt grazed outside of the cities and people grew their crops outside the city walls as well.